Structure of 5-methylcytosine (5-mC), a methylated form of cytosine in DNA. 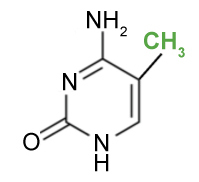 DNA methylation is described as the covalent addition of a methyl (CH3) group at the 5-carbon position of cytosine, which results in 5-methylcytosine (5-mC). This process occurs via a group of enzymes known as DNA methyltransferases (DNMTs). DNMTs such as DNMT1, DNMT3a and DNMT3b are necessary for transferring methyl groups onto the cytosine and for maintaining the patterns of DNA methylation. The creation of 5-mC prevents transcription from occurring and, specifically, reduces gene expression and plays an especially pivotal role in cancer. DNA methylation is essential for normal development and occurs due to age, diet, environment, and other aspects. However, if abnormal DNA methylation occurs, diseases and other developmental issues can often ensue. DNA demethylation, or the removal of a methyl group, is also important to epigenetic processes. Specifically, DNA demethylation is involved in the epigenetic reprogramming of genes and research indicates it is directly involved in several important disease mechanisms, for example, the progression of tumors. Epigenweb offers resources for understanding DNA methylation and the best research practices for accurate and reliable quantitation of 5-mC, 5-hmC, and 5-fC levels. Accurate measurement of total 5-methylcytosine (5-mC) can be difficult with numerous global DNA methylation assays available, each with its own advantages and disadvantages. 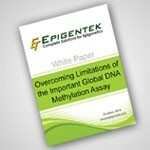 Take a look at this white paper, “Overcoming Limitations of the Important Global DNA Methylation Assay“, written by epigenetic scientists that describes new and old methods, how to overcome assay limitations, and the optimal assay for investigating global 5-mC levels. Epigenweb provides researchers with resources for tackling their DNA methylation research. This site offers white papers, scientific literature, and technical guides to help with your global DNA methylation studies. 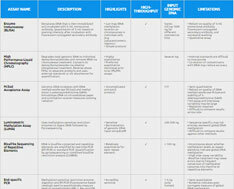 Click to see a comparison chart of all global DNA methylation quantification assays including descriptions, advantages, and limitations of HPLC, Bisulfite Sequencing of Repetitive Elements, End-specific PCR, ELISA, M.SssI Acceptance Assay, LUMA, and LC-MS/MS.